83 anime images in gallery. Tagged under Haruka, Senran Kagura and Toyoguchi Megumi. Haruka (春花) is a playable character from the Senran Kagura video game series. 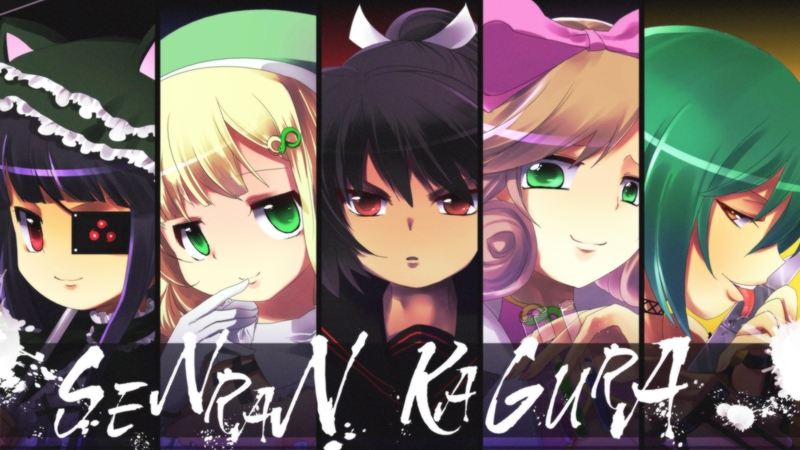 She makes her debut in Senran Kagura: Portrait of Girls, and becomes playable in Senran Kagura Burst: Crimson Girls. 3rd-year student. A sadistic Ojou. A queen type character who is extremely sadistic, however she has an abundance of feelings for her underclassmen and is a motherly figure amongst the girls. Haruka has brown hair that is curled at the ends with a large pink bow on top. She wears what resembles pink and white lingerie with white cups, and a diamond shaped opening revealing her cleavage. On her legs and arms are white garments, and she wears thin white bottom with simple pink high heels. On her back is a large white lab coat lined with many different vials filled with hazardous chemicals. In Shinovi Versus, the bottom of her breasts are left uncovered, and she utilizes a robot that inhabits her lab coat. This machine fills the right arm of her coat with a deadly red chainsaw, and the left with a three fingered robotic arm of its own. She treats her enemies like they are toys. Haruka likes to pick on weaker people, this explains why she seems to have her eyes on Hibari.